When the cheese is melted and gooey, sprinkle the sliced green onion on top. Enjoy! 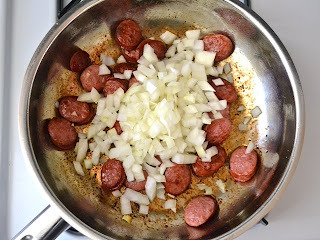 Thinly slice the smoked sausage and add it to a large skillet with 1 tablespoon of olive oil. 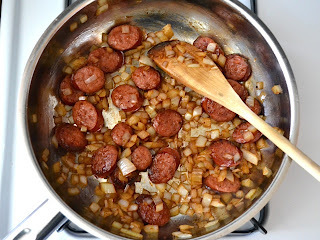 Saute the sausage over medium heat until it is nicely browned (about 5-7 minutes). Drain off the excess fat. Dice the onion and add it to the skillet. Continue to saute until the onion has softened (about 5 minutes). Add the can of diced tomatoes with chiles and the chicken broth. Stir to combine and dissolve any browned bits off of the bottom of the skillet. 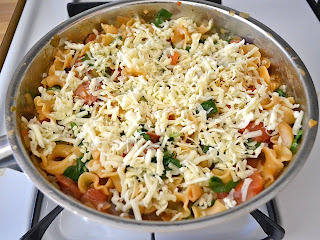 Add the uncooked pasta to the skillet and make sure it is all submerged under the liquid. Place a lid on the skillet and allow the mixture to come up to a boil. 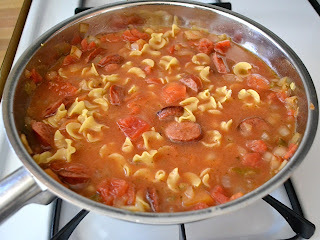 Once it reaches a boil, turn the heat down to low and let it simmer for about ten minutes, or until the pasta is tender. 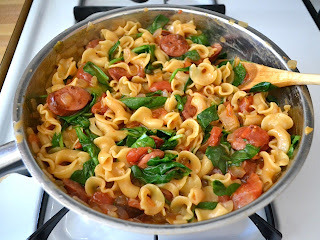 Stir once or twice while the pasta cooks to keep it from sticking. Stir in the fresh spinach, one cup at a time, until wilted. If you add it all at once, the skillet will be too full to stir. Keep the heat on while adding the spinach, so the liquid will continue to simmer and thicken. 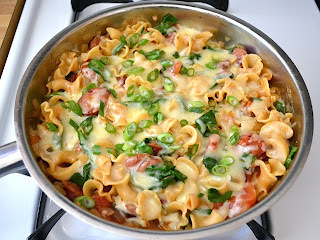 Sprinkle the shredded cheese on top, replace the lid, and let it sit for a few minutes, or until the cheese is melted. Slice the green onions and sprinkle them over top. Serve hot! 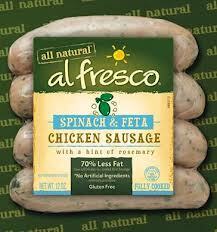 I like to use these chicken sausage sparingly they have lots of favor, like past and vegetables. So, I only used half of this 13 oz. link and froze the rest. There was still plenty of meat in each serving! 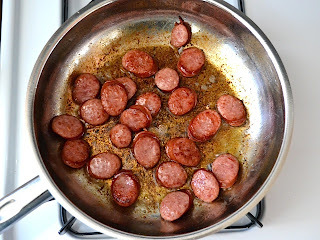 Slice the sausage thinly (so you get more medallions and more in every bite), then cook in the skillet with olive oil over medium heat until browned. Drain off the excess fat after it has browned. Dice the onion and add it to the skillet. Continue to saute. Cook until the onion has softened. As you can see, the moisture from the onion has dissolved most of the browned bits off of the bottom of the skillet. That’s a good thing. If not all of it comes off, that’s okay because it will dissolve in after we add the liquids. 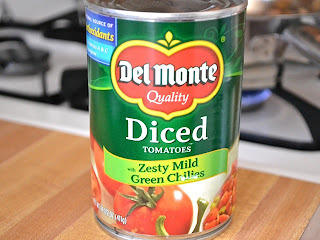 Add the can of diced tomatoes with chiles (this is the same as Rotel tomatoes). If you can’t find these in the grocery store, you can use regular diced tomatoes and a separate 4 oz. can of diced green chiles. 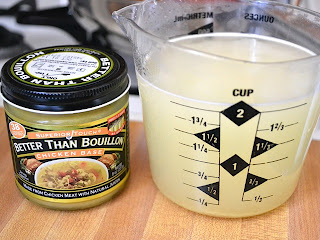 Also add the two cups of chicken broth. 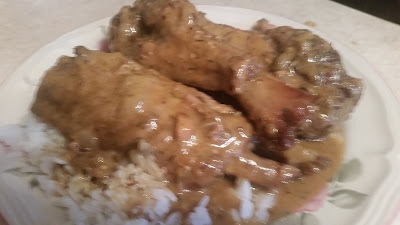 That is the chicken “base” that I use to make broth for recipes. It’s usually between $4-$5 for one of those little jars, which makes 32 cups and stays good in the refrigerator for a LONG time. It also comes in many different flavors (beef, mushroom, vegetable, low sodium, organic, etc.). 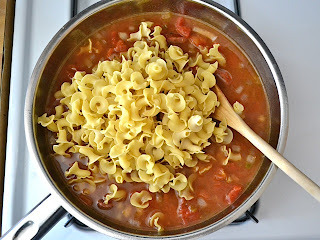 Once you’ve added the tomatoes and liquid, add the dry pasta. 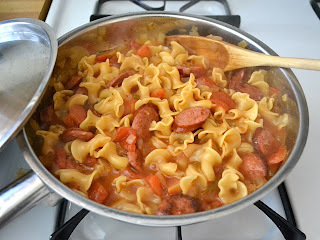 Make sure the pasta is mostly under the liquid so that it will cook. Put a lid on top and let the skillet come up to a simmer. Once it reaches a simmer, turn the heat down to low and let it continue to simmer for about ten minutes, or until the pasta is tender. Stir it once or twice while it’s cooking to make sure the pasta doesn’t stick. And then like magic it looks like this! 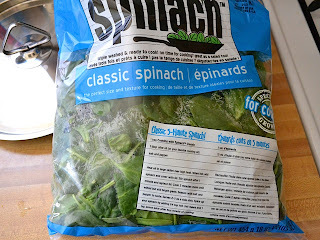 I bought this HUGE bag of spinach, which, believe it or not, was only 50 cents more than one of those small bags of salad spinach. It’s the exact same thing, just marketed as “spinach for cooking”. Psh. They can’t fool me. Stir in one cup at a time until it is wilted. Let the skillet keep simmering away as you do this so that the liquid will thicken up a bit. Sprinkle the shredded cheese over top, put the lid on the skillet, and let it melt. Monterrey jack cheese is especially creamy and helps make the whole dish creamy despite not having any cream in it. Mozzarella will not have this same effect.